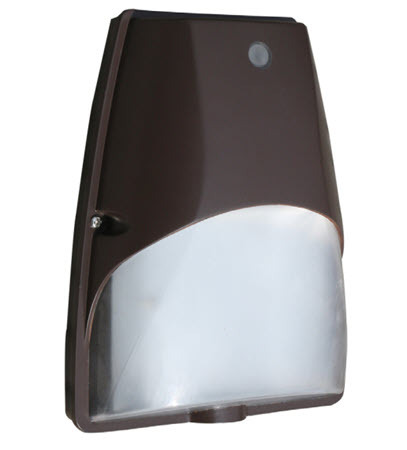 LED mini wallpack light fixture - 12 watt for many types of security and general lighting needs. 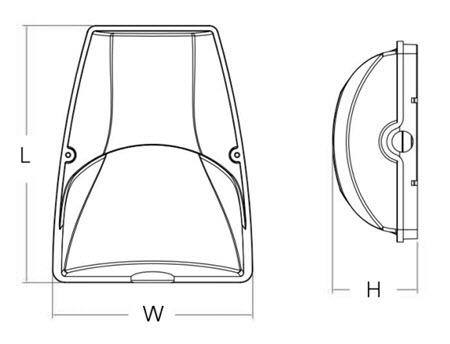 It comes with an energy efficient fixture with a unbreakable polycarbonate lens. Many people like the instant-on capability of the LED lamps, and the heavy duty construction for years of service. Replaces up to a 70 watt high intensity discharge lamps like metal halide or high pressure sodium. - Replaces 70 watt HID. - 70,000 hour LED life. - UL listed for wet location. - Non-cutoff optics ideal for maximum light distribution and visual comfort. - 70,000 hour rated life. - Includes pre-wired photo electric control. At BuyLightFixtures.com, we strive to provide you with the best outdoor LED wall pack fixtures on the market today. We know that energy savings are essential, but getting the best quality and the best performance is also part of the equation. As we often say, if you save all the energy possible but get poor lighting, you gain nothing. That’s why we have a wide selection of outdoor wall pack lights that are going to give you the kind of lighting performance for your application. Typically these are used outdoors, and these are made to replace HID lighting such as metal halide or high-pressure sodium. And they do that by using high output LEDs that give you the most lumens per watt possible with the right color temperatures and distributions. One of the ways that people use wall pack lighting is for security around buildings and walkways. There usually mounted upon a structure at some height that will cover the area very well. This is generally specified by an engineer or an architect, but some people decide to add them later if there a building owner or manager. Having good lighting in an area is probably the cheapest form of insurance you can buy. It’s a known fact that crime goes down when the light is right. Criminals don’t like well-lit areas because they can be seen on cameras very well and by other people. So this form of building security is probably one of the most important that you can have. Another aspect to LED wall pack lights is that you can get a higher amount of control over the lighting than you could see in the past. Up until recently, HID lighting was difficult to control as it is a more significant source of light. Light fixtures had to be made with all sorts of different reflective surfaces inside of them to control the light in a particular direction. And of course there were some of these light fixtures that didn’t have any form of lighting control, and sometimes they were just called glare bombs. It was just a blob of light, and that’s what would be called a wall pack back in the day. With the advent of LED you get greater control because the LEDs themselves are directed in a particular distribution rather than relying on light bouncing around inside of a box. This will help reduce light pollution if you can get the light directed down and not going up everywhere. Industry people call this a full cutoff type of light, and it’s efficient to reduce the effects of light pollution. So if you have a commercial building and you want to comply with dark sky conditions, then you deftly wish to have something that’s a cutoff light fixture and not use any more wattage then you need to for the application. Saving money is always nice. Energy savings is another part of the equation when it comes to LED wall lighting; the savings can be substantial as these will run from dusk to dawn. If you would like to know how much you can save in real dollars, we have an energy savings calculation spreadsheet which you can download for free from the left-hand column of our website. It will give you an estimate as to how much you can save and the payback that you will get by implementing new light fixtures equipped with LED. The paybacks can be very good, and in this type of situation when you’re talking about a wall pack light, you might be looking at something that pays back anywhere from 1 to 3 years depending on the wattage and the application. But our spreadsheet can give you a perfect estimation as to the reduction of your lighting bill. There’s something else to consider when it comes to outdoor lighting. A lot of people have a preference for specific color temperatures, and in the past, they never had a choice of that. Today, you get all the color choices you want everything from a warm white color to something that’s more like outdoor daylight. Most people prefer the 5000K daylight color because it’s such a bright white light. Most people prefer that for security lighting for parking lot lighting. But you do have a choice, and you can go for something that’s warmer if that works out for your outdoor space. It’s merely a personal preference, but on many of these lights we have that option, and you can take a look at which one you prefer before purchasing. All of these LED wall pack lights our high-quality commercial lights, many times with die-cast aluminum housings, UL listed and a proven track record of performance. Unlike big box stores they carry residential grade outdoor lighting which is often imported from untested sources, we only sell quality lighting products. It’s all commercial grade lighting, so you know you’re going to get something that has a construction that’s going to last for many years to come and give you the lighting performance that you need for security and other types of general lighting. There are many different manufacturers of these type of lights everything from Cooper to Lithonia Lighting, but typically we stay with manufacturers that are real specialists in this kind of lighting. They know what works and the construction reflects that, and usually, the price is lower than some of the more prominent manufacturers. If you’re unsure as to what you might need to use for your next wall pack light, you can always call or email us with any questions that you have. If you have an older HID lighting system and want to know what a suitable LED replacement would be, we can help you in that area too. We can also do a lighting layout that will show you exactly how many footcandles you’ll get in the area and the light spread that the light fixture will put out. We do that for free for anyone who’s looking to purchase our lighting fixtures. There’s never been a better time to take a look at upgrading your outdoor lighting with LED with all the right choices we have for you.